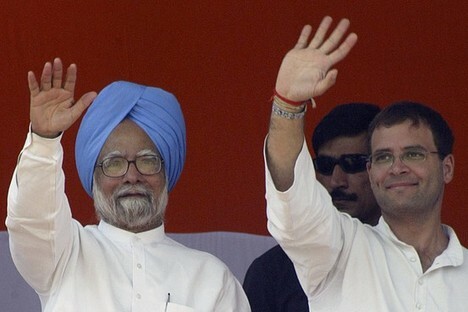 “India’s Prime Minister Manmohan Singh, left, and Rahul Gandhi wave to supporters during an election campaign rally in the northern Indian city of Amritsar May 11.” Source of photo and caption: online version of the WSJ article quoted and cited below. (p. A12) “Manmohan Singh will be our prime minister,” said Sonia Gandhi, president of the Congress party, at a televised news conference with Mr. Singh. Mr. Singh, in typically low-key fashion, spoke at the same conference in such a quiet voice that his two minutes of remarks were inaudible over the din of the press corps, and he was forced to return to the microphone to repeat them. “The public has expressed faith in Congress,” he mumbled. Mr. Singh, who earned honors from Cambridge University in economics and a doctorate from Oxford, was an architect of India’s economic reforms in 1991 that are credited with setting the nation on course for the economic boom it has had over the past few years but that is now slowing. He is widely seen as honest in a system where bribery of politicians and voters is commonplace and more than 1,000 political candidates in the national elections faced various criminal charges. The election “is an endorsement of the programs and policies initiated by Manmohan Singh,” said Sanjay Kumar, fellow at the Centre for the Study of Developing Societies in New Delhi. PAUL BECKETT and VIBHUTI AGARWAL. “Voters Give Singh New Political Life — and a Mandate; Decisive Re-Election Presents New Opportunity to Indian Prime Minister; Reaching Out to Rahul Gandhi, and Youth.” Wall Street Journal (Mon., MAY 18, 2009): A12. Respactable PM Sir & a great economist good day and time I am ratan Das Vaishnav an Indian want to be economist but I dont know what I have to do I know that it is not a proper way to consult with you But as well as I know I haven’t your personal info so I use this way to you. I am a poor student who just passed class 12th and join ajob but my all n one only one aim to be economist so please ignor the way of asking such question & reply me. I’ll want to economist like you. It will be your gratitute to give me little response. bhagwan aapko lambi umar de.